← Robert and Nathan Hyde pattern book, 1771. Thanks to Christian and Johannes Zinzendorf (and Linda Eaton who arranged it and drove me!) I finally achieved a two year ambition, to turn flax stems into fibre. We started off with 2 year old flax stems, which were harvested when a bottom third of them stem was yellow. In their experience this provides both viable seed and good quality fibre. 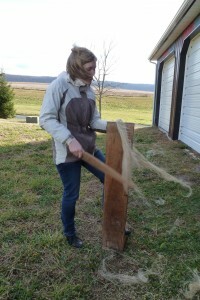 The first stage is to break the flax stems using a flax break or brake. 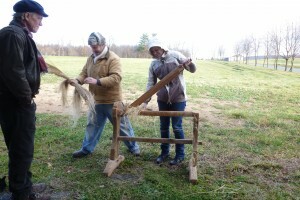 You move the wooden blades up and down, which crushes the flax stem into small pieces. As you can see from the first image, the break isn’t made from solid wood. The blades alternate between top and bottom which means that the flax stem is broken into small pieces rather than crushed. Next the fibres are scutched or swingled to remove the remaining chaff/stem. This involves holding them on a wooden board and hitting them with a wooden knife or cutlass at a 45 degree angle. 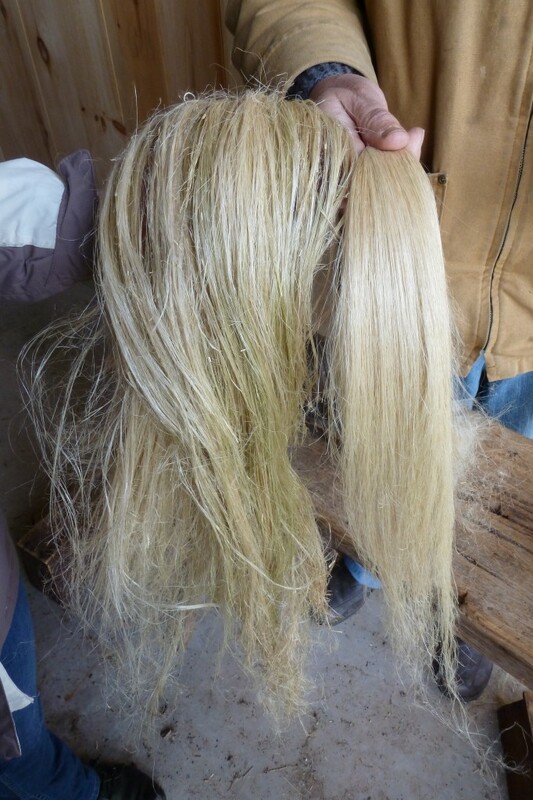 The fibres also begin to shine during this process. See this William Hincks print for a contemporary representation of scutching. The final process to turn the scutched fibre into fully processed fibre is heckling or hackling. 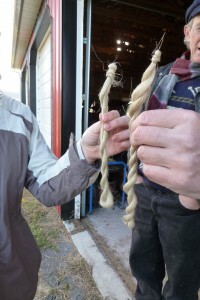 Hackling (the same as combing) pulls out any lumps, remaining stem and straightens the fibres ready for spinning. As the photo above shows, the volume of fibre dramatically decreases. 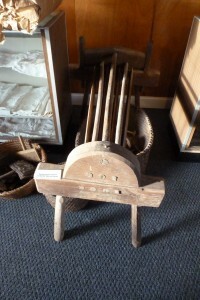 The coarser shorter fibres called tow, separated in the heckling process were still used to make linen, used for heavy duty textiles such as sacks. The fine fibres, the tear, on the right of the image were used to make the finest quality linen. The William Hincks print shows heckling too. You can see the tow left behind in the comb. We used two different heckles; the first had widely spaced nails, to pull out the coarsest fibre, moving onto a finer heckle to refine the fibre further. Christian then showed me how to wind my tear fibre into a strick. The finished product! Comparison of the two stricks emphasises the importance of tacit knowledge. However, by working the flax myself, breaking the stem into small pieces, scraping them off and combing the coarse fibres out, I really ‘got it’. The whole process now makes sense. For me this experience reemphasised how important it is for people studying material culture to have a go. You won’t master the early modern processes that you are trying out in a day, but you’ll understand the process and the expertise required much better. 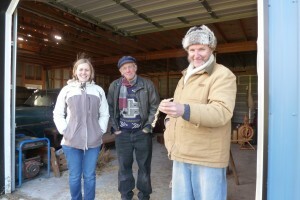 Christian and Johannes also have an excellent collection of flax processing tools and spinning wheels. For information on arranging a visit look at their website. This entry was posted in Spinning Project. Bookmark the permalink. What a great experience Alice! The “practicum” makes for a much better understanding! 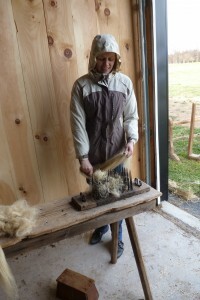 Hoping to see you here again, perhaps working out some weaving projects! Thanks Angela. I’d love to come back! Spinning little stories about the High Wage Economy.